There were various booths of food and accessories at the Craft Fair. They are the members of Setagaya Aloha with their wonderful smiles. An Akiba-Kei idol, Momoi was full throttle this year as well. 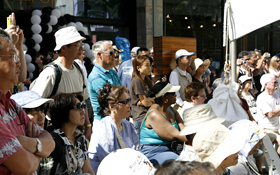 The 3rd day was the final day of the Honolulu Festival which these 3-days passed-by quickly. 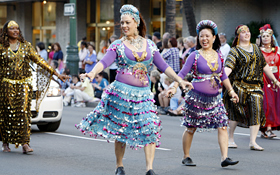 The Stage Performance was held at 4 venues including the Hawaii Convention Center, Ala Moana Center, Waikiki Beach Walk and Waikiki Shopping Plaza. 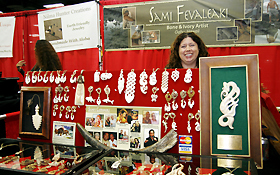 The Craft Fair and Ennichi Festival were also held at the Hawaii Convention Center. The stages, exhibitions and booths in the Craft Fair as well as the Ennichi Corner were packed with people. There were many family visitors at the venue. 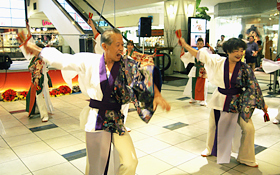 There were various performances on the stage of the Hawaii Convention Center. The program started off with the Japanese folk song and dance by the members of Amami Minyo No Kai. Also, the members of Association Naruto Awa-Odori Promotion from Tokushima Prefecture performed Awa-Odori. 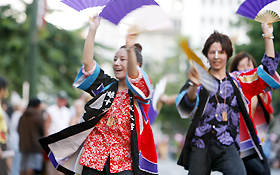 Then, the indispensable group for the Honolulu Festival, Sugaizaniren performed their energetic dance. Furthermore, the members of Ryukyu Koten Afuso-ryu Ongaku Kenkyuu Choichi Kai Hawaii participated for the first time, which they performed a classical Okinawan music and dance. 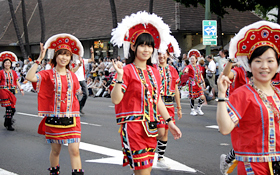 In addition, Momoi who is known as an Akiba-Kei idol performed on stage which showed a wide range of Japanese culture. Kei Komaki from the group Setagaya Aloha said “I want people to enjoy through watching our hula dance…I want to do something for others.” Also, she showed her splendid smile during her performance and we were able to understand the meaning of her words which made us feel happy as well. 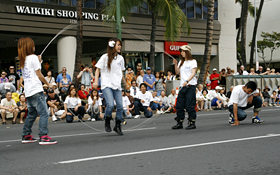 The performances were also held at the Waikiki Shopping Plaza which is located toward the center of Waikiki. This venue is smaller compared to others but the seats were closer to the stage which excited the audience. There were unique performances including a sword action by Brave Season “Basara”, Nagoya harp by Taishogoto G. Tanuki and the Japanese traditional arts called Nankin Tamasudare by Japan Nankin Tamasudare Association. The members of the yosakoi dance group called Mai Pure Ren from Ibaraki Prefecture and Gunma Prefecture participated for the first time. They were sweating from dancing which many passers-by stopped to watch and gave a big applause after a passionate performance. The members of Mai Pure Ren participated for the first time which they showed their lively expressions. 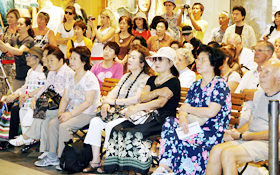 It was crowded enough that the audience required to stand and watch the performances. The Waikiki Beach Walk was another venue which is known as a place for fancy shopping and dinning. It is probably the best stage that creates a Hawaiian atmosphere, where the palm trees are blowing in the wind. It was a nice weather and various performances were taking place under the blue sky, which left a different impression compared to the stages at other venues. The members of Ritsumeikan University dig up treasure performed skillful double dutch and the members of Association of Naruto Awa-Odori Promotion from Tokushima Prefecture performed Awa-Odori. 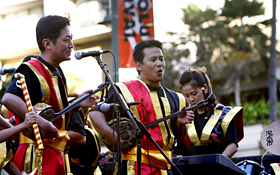 In addition, Dai Hirai performed a theme song for the Honolulu Festival. Also, the taiko drumming performance by the members of Taikojuku Miyako from Ibaraki Prefecture was powerful and humorous at the same time. Many audience enjoyed watching the Japanese traditional arts, which went beyond the language and cultural barrier. As a result, numerous audience gathered by the stage where there were continuous applause. The members of Taikojuku Miyako gave such a powerful performance which didn’t sound like the children are performing. 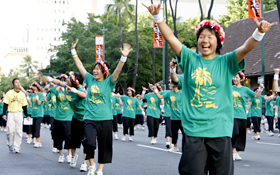 The Grand Parade was held for the finale on the streets of Kalakaua Avenue after the performances at each venue. 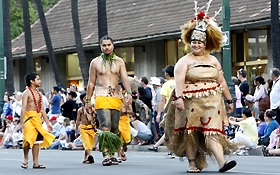 The parade started from Fort DeRussy Beach Park which is located at the outskirt of Waikiki. The beautiful green of the park and the colorful costumes as well as the floats of the participating groups were shinning by the sunlight. Also, you can interact and take pictures with the performers before the parade which can be a memorable experience. Furthermore, there were opening performances held at 3 places. Dai Hirai performed a theme song for the Honolulu Festival in front of Moana Surfrider, A Westin Resort & Spa where the seats were reserved for the V.I.P. 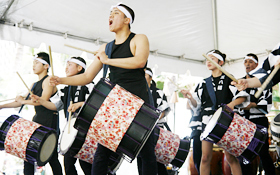 and Taikojuku Miyako performed the passionate taiko drumming in front of Pacific Beach Hotel. Also, Ritsumeikan University dig up treasure from Kyoto performed double dutch in front of Waikiki Shopping Plaza. They entertained the audience until the parade began. 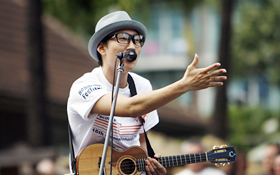 Dai Hirai’s gentle voice resonated throughout Waikiki. The members of Ritsumeikan University dig up treasure performed double dutch. Then the parade began with a police motorcycle barricade which led the parading routes. 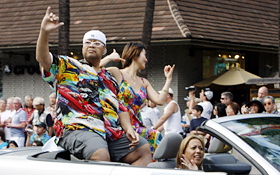 It was followed by the marching band and Mufi Hanneman, who is the Mayor of Honolulu appeared on a convertible. Also, the winners of the beauty pageant Miss Kona Coffee and Miss Korea made the appearance. In addition, a former Sumo wrestler named KONISHIKI appeared as a surprising guest. 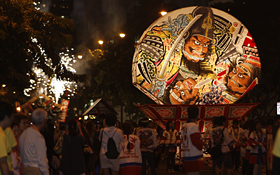 Meanwhile, the Chinese lion dance and mikoshi (portable shrine) paraded the streets which set the mood for the festival. 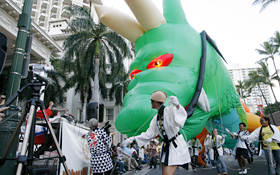 A total of 70 groups participated in this year’s Grand Parade. There were performers from various countries than previous years such as Taiwan, Australia and so forth. Also, there were variety of performances including the Samoan dance, Korean dance and Tahitian dance; berry dance, cheerleading and step dance; hula, Okinawan music and dance; yosakoi dance, Awa-Odori and taiko drumming. The cheerful voices of the children from Inaho Kodomo Mikoshi echo on the streets every year. KONISHIKI appeared as a surprising guest. The members of Sogaimiti Inc. performed the Samoan dance where they slap their body. 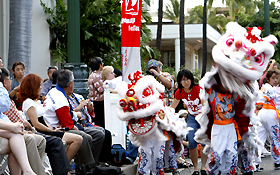 The Chinese lion dance is popular every year which is being performed closer to the spectators. What’s unique about the traditional Taiwanese dress is the prettiness with vivid coloring. 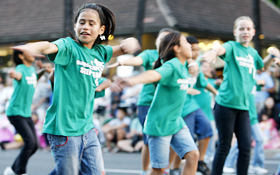 The members of the Nanikapono Step Team stepped lightly and danced. The members of Ryukyu Koten Afuso-ryu Ongaku Kenkyuu Choichi Kai from Hawaii and Japan performed together. Many hula dancers participated from all over Japan. You can enjoy just by looking at the costumes of the berry dancers. 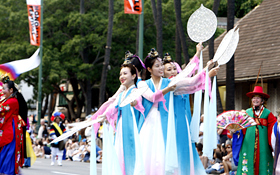 The traditional Korean dance reminded of a heavenly maiden. Miyagi University Kosuzume participated for the second time this year. The members of Sonoda Gakuen High School were full of beans as usual this year. 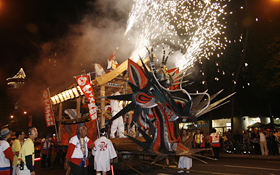 A gigantic float of Ryujin by Saitama Ryujin Matsuri Kai approached rapidly towards the audience. 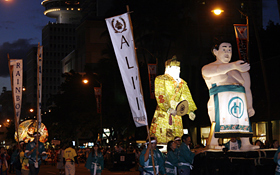 The Hilton’s Sumotori Mikoshi owned by Hilton Hawaiian Village is so huge that you have to gaze up. The illustration on the Aomori Hirosaki Neputa is designed in Honolulu every year. 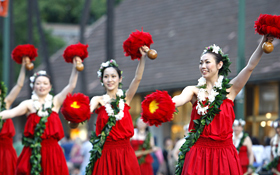 Without a doubt, the finale for the Grand Parade is the Honolulu Daijayama. Furthermore, the floats of Saitama Ryujin Matsuri and Hirosaki Neputa from Aomori Prefecture made the appearance representing the Japanese festival. Also, a cart of the Honolulu Daijayama made the appearance as well which was used for the former Kyushu Omuta Daijayama until 2008 . Those powerful representations surprised the audience. What was surprising was that a cart of the Honolulu Daijayama made a big spin. A big head turned away and started spinning as it made a squeaky sound. 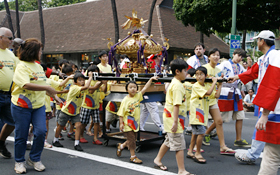 The shouts of those who were leading the cart and the sound of applause from the roadside resonated throughout Waikiki. The Honolulu Daijayama was spinning with sparks of flame while making a hiss sound, which everybody looked amazed. This sudden spinning performance was done for the first time in 7 years. Also, there were a lot of local volunteers than previous years which made the Honolulu Festival lively. We are looking forward in making the locals feel proud about our event. Also, we will strive to be loved and anticipated by many.